Thank you for your enquiries. The Saviour painting has sold. It was purchased in Zozimus gallery in Dublin for EU2,000. These are two of my paintings which are showing at the Kennedy Gallery, Dublin. There is a vernissage/opening this evening (29th of November) at 7pm. 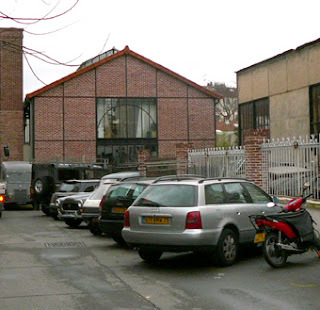 The address is M. Kennedy & Sons Ltd, 12 Harcourt St, Dublin 2. You'll find the exhibition on the first floor. Enjoy the wine and cheese. Yong Man Kwon, from south Korea now living in the south of France. View of Korean works and statues by Yvone Cleragerue. I also visited Art en Capital yesterday. It took place in the Grand Palais des Champs Elysees, Paris. This is an annual event. An exhibition of artists who are not represented by galleries and who live and work in the centre of Paris. The first thing that strikes you is the enormous number of artists that are in Paris who are eager to exhibit but who are not represented. 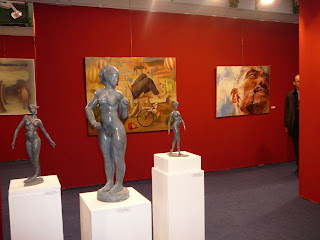 The exhibition had several hundred artists. It's very confusing to see this exhibition because there is no jury process and as such you have very good work placed beside not very good work. On the other hand, as the organisers say, the public decides what is good or not. If you want to, you can reserve an entire 9m stand for your work which protects it from landing beside the work of someone that won't compliment it. It's a bit expensive but as there are thousands of art buyers attending the investment is a good one and great marketing. A lot better value than a particular, Irish art fair, at half the price. There was some terrific work there. Particularly from visiting Asian artists. Their levels of skill and focus are impressive. In huge contrast with European artists there is an energy and daring in the work that is very strongly restrained. It feels like a wild horse that has been, barely tamed and is only holding itself back enough to perform for a particular moment. Unlike a lot of European art where the artists almost seem bored or going through the motions in their work. The Asian artists have a lot of academic background and training yet they also have this fierce energy to get out there and express something bigger, better, brighter and stronger. Bursting out of the restraints of their academic training and using that famous focused intensity. Yesterday, after setting up in the atelier in Bastile, I visited two exhibitions that I had been curious about. One was in Nation. 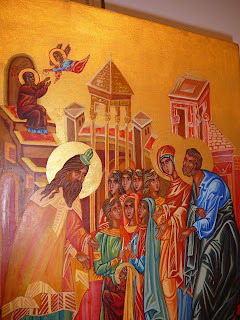 An exhibition by an Icon Painter who studied in Greece. The exhibition took place in a small gallery on the second floor of the Centre Culturel Franco-Japonais, 8 Passage Turqueti, 75011 Paris. Metro -Nation. 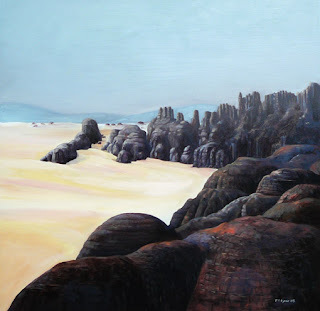 The artist is Dominique Groffe. The artist has reproduced paintings of icons on wood using gold and tempera (egg). I'm interested in this because it's a subject that I'm studying at the moment. By doing the course you learn an enormous amount about the history of painting (as far back as the Egyptians) and you discover some of the most unlikely mediums with which you can paint and which last for thousands of years. Although I like the artists ability to recreate the icons of past artists, I didn't see anything new being explored in the work. Creating an icon where the subject is religious is like a prayer for many people. A meditation and study of past works and as such gives a great deal of personal pleasure. The original images are full of hidden meanings as well and were not merely decorations. So that is also a study of history in itself. It's fantastic to see this kind of work still being done. Otherwise it just disappears forever. Well I'm heading off to Ireland next week and looking forward to meeting all the other artists at Art Ireland. It should be a great time, though I've no doubth, hard work. There won't be a chance for a vernissage or anything like that so we decided to have one here in our house before leaving France. We needed a good excuse to clean up properly anyway. Things were a little dustier than expected but we managed to turn the house into a gallery for one evening. Have to say, that I'm really amazed and pleased by how many friends and neighbours turned up. It was a full house! Bursting at the seams! We had a great time and the preparation was well worth it. Terrible hangover the next morning. Must have been all the talking. Shouldn't talk and drink at the same time. Anyway here are some photos. If you are coming to Art Ireland between November 16th-18th drop into stand Q2 and say hello. This image came to my mind several years ago and I made a drawing. It has continued to come to my mind as the terrible effects of man made climate change wreck havok on the world. The planet will survive ultimately but as it attempts to cleanse itself of the cause of the damage a lot of ecosystems and species will be destroyed. Tempera and oils on board. It's been a while since I posted anything. There were a few distractions that, thankfully are now out of the way. I've been painting in my media of choice for the last few months and am pleased with the results. The more I get to know it the happier I am to have discovered it. These are a couple of recent portraits. I'm not attempting to capture the reality of the person just the impression and according to the people I've painted so far, that's succeeded. 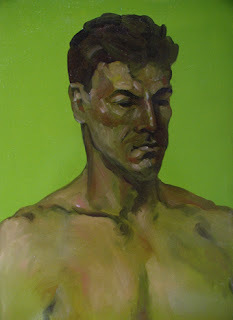 In each case I've painted the person in one session using oils and tempra. The amount of tempra is very little. Most is in oils. It's very instinctive for me to work like this. A lot of good energy is created though it seems to be freaking out some of the other artists that I'm sharing the model with. Got to be a good sign. 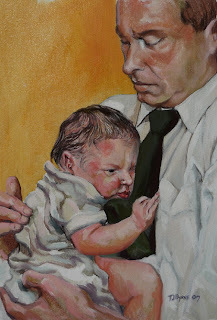 A portrait on canvas and painted in oils and tempera. In the collection of Anne Frain. This is the current state of the Fresco. There is one more panel to complete. I get emails from people about this blog but no one posts comments. I don't mind but feel free to comment. I've been busy in a good way. It's still pretty cold for Spring but there are good days too when the sun is glorious. The birds have the right idea though. They set up a right corus in the mornings and it's good to walk through the forest when they are singing and collecting for their nests. They seem to be having a great time while doing it. I've been working on a fresco. It's very large and is being done on sheets of canvas which will be transfered to the clients wall when complete. It will consist of marble Portor pillars with Greek caps and gold edging. The landscape is fronted by a ballustrade and a path leading into a park. The person and her dog are the client and the photo here is the underpainting in preparation for the final colours. I'm doing it in oils on canvas in my studio. 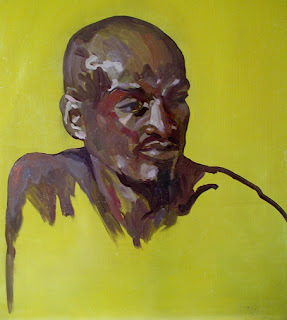 The portrait below is done in tempera on board and is in the underpainting stage here. Initially working over green grey with white tempera for the tonal values in the painting. Once dry this will receive a series of transparent oil glazes to add colour & bring life. The light passes through the glazes and reflects off the underpainting. It's a beautiful and mysterious way of working and you can concentrate on the values seperate to the colour. So you have the chance to create a much richer and harmonious painting. It takes longer of course :) C'est la vie. I've also been doing a lot of drawings lately but don't have them scanned in. Happy with them though. Especially the very fast ones. You can create dozens or even hundreds of drawings over a period of months but it's rare to find one that will stand on it's own as a proper piece of work. This doesn't have to be particularly finished or shaded or 'worked up' in any sense. It has to have a sense of harmony and sometimes you will get a series of these all at the same time. It's rare though. I got a series of these last week which I'm pleased with. So if you see a drawing with no real detail but which just sings to you. Don't dismiss it as not being a 'finished' or as an 'uncoloured' piece of work. It's the result of a lot of work which led up to that moment. Sometimes the result of years and years of work. All of it coming out in a moment and appearing on the paper like a piece of magic. Preserved like a butterfly pinned to a board. Don't pin butterflys to boards. Drawings are much more earth friendly. I'm a grown adult. 40 years of age and I can proudly state that I have done my best to not damage the environment through use of a car in my life. Till yesterday. I took my first driving lesson with my wife beside me giving me directions on how the car works. It was remarkably easy and we didn't almost kill anything. So why now? I live in the countryside outside of Paris and often have to nip into the city with work or to colect materials. Large paintings or even a series of large paintings under the arm are not a great idea on the train especially during rush hour. So what now? Am I going to pollute, pollute, pollute in the name of art? I don't think so! Trips in the car will be rare. I still don't like cars much, or at all really. As well as that, in April we are visiting a company in Lyon who manufacture a car that runs on air. Yes! Air! It's been in production for a while and was first shown at the Paris car show in 2002. It was a bit of a put...put...put machine back then but aparently, has improved a lot. If it hasn't we won't go near it. It goes 200K on compressed air and after that the fuel kicks in, which is vegatable oil, diesel or petrol. Someones got to try them out! You can be sure that if it's good I'll post more info here about it. I reckon the hydro car is going to cost a fortune initially so while that's getting over itself we'll drive this and keep things clean. That or stick to the diesl that we have at the moment. There's a lot happening at the moment. 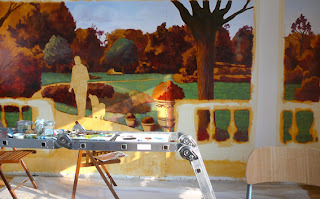 I'm working on a large painting for a client in Paris. It's very large so I have to do it on several sheets of canvas and then join them together. More on that later, when it's finished perhaps. In the meantime I've done a nice portrait and a desert landscape. The landscape is a wedding gift, from the bride to the groom. A nice idea. He spent some time in the desert and loved it so much that he speaks about it quiet often. This took over a week to complete. It's a large canvas. Not done from life unfortunately. The other is a portrait of a young girl. She has a rich dark brown skin, like a chestnut just out of it's shell. It shines in the softest of sunshine. She has modeled for six hours for this portrait. It requires a little more work and I'm looking forward to finishing it. The landscape is done in traditional oils and the portrait is done in tempera. This video is vital information on the future of the planet. Christmas 2006 was a very good Christmas. We spent it with Amelies parents in the south of France. It was good for many reasons but mostly because nither of us worked during the time and I could communicate well in French with family and friends who didn't speak English. On previous visits I needed to have an interpretator or to stumble through conversation. Finally I feel like I am in France. other surprising out of season elements. It was very beautiful. We went hill walking and visited some of the mountain fortresses from Pre Roman times. There was the usual amazing feasts which only the french can do. Eating for six hours straight and looking like you've just finished a salad is no longer a surprise to me. I can't do it though. They tell me that they only eat soup for weeks after these events to get back into shape. Wine and dark chocolate are part of this diet. It's remarkable to me. Irish people don't think about food the way the french do at all. There was lots of inspiration there. Beautiful light and amazing architecture. The landscape is wonderful. Many paintings and drawings will come from this.